Mozambique, just south of Tanzania and north of South Africa, is an exotic country with a laid-back charm. It boasts a 620-mile Indian Ocean coastline that is dotted with beaches, offshore marine parks, and coral islands. Mozambique is an excellent location for diving, snorkeling, and numerous other watersports. The delightfully well-preserved Portuguese colonial architecture adds a historic and cultural lure, and the consistently tropical climate make this an inviting paradise. Maputo (Fortress of Maputo), built by the Portuguese in the 18th century. Across the bay, Inhaca Island offers beaches and diving reefs. Some other local sights the Cathedral of Our Lady of Immaculate Conception, the Casa de Ferro and Museum of Natural History. 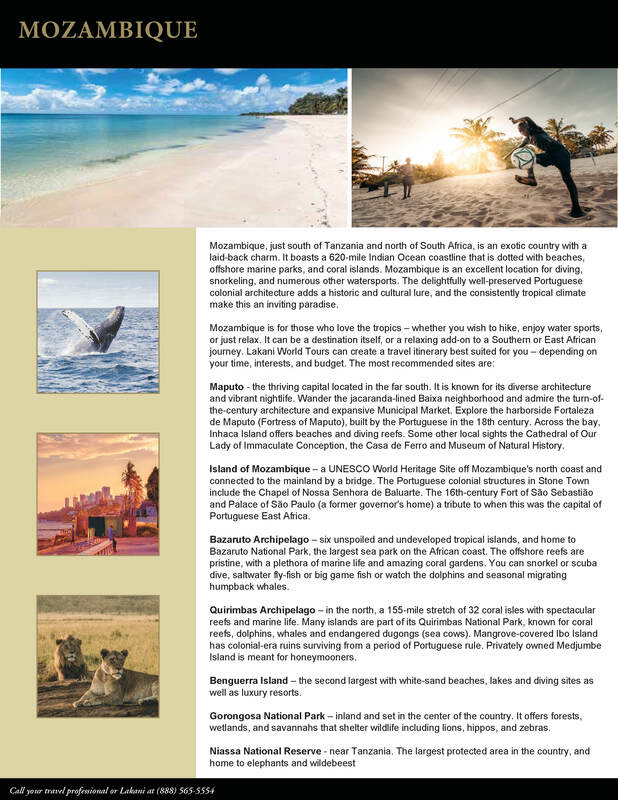 Island of Mozambique – a UNESCO World Heritage Site off Mozambique’s north coast and connected to the mainland by a bridge. The Portuguese colonial structures in Stone Town include the Chapel of Nossa Senhora de Baluarte. The 16th-century Fort of São Sebastião and Palace of São Paulo (a former governor’s home) a tribute to when this was the capital of Portuguese East Africa. Bazaruto Archipelago – six unspoiled and undeveloped tropical islands, and home to Bazaruto National Park, the largest sea park on the African coast. The offshore reefs are pristine, with a plethora of marine life and amazing coral gardens. You can snorkel or scuba dive, saltwater fly-fish or big game fish or watch the dolphins and seasonal migrating humpback whales. Quirimbas Archipelago – in the north, a 155-mile stretch of 32 coral isles with spectacular reefs and marine life. Many islands are part of its Quirimbas National Park, known for coral reefs, dolphins, whales and endangered dugongs (sea cows). Mangrove-covered Ibo Island has colonial-era ruins surviving from a period of Portuguese rule. Privately owned Medjumbe Island is meant for honeymooners. Benguerra Island – the second largest with white-sand beaches, lakes and diving sites as well as luxury resorts. Gorongosa National Park – inland and set in the center of the country. It offers forests, wetlands, and savannahs that shelter wildlife including lions, hippos, and zebras.